The Illinois Society of Eye Physicians (ISEPS) is a professional medical society comprised of Illinois ophthalmologists (medical eye doctors) who pay annual dues to the association. The ISEPS provides its members with legislative advocacy, professional education opportunities, as well as other member services. If you are interested in joining the ISEPS, please contact our administrative office at 847/680-1666. Membership Application -- This will link you to a pdf file of the ISEPS membership application. View a short video about ISEPS and the work our members do. Board of Directors--This will connect you to a list of current ISEPS board members. Board of Directors Information Page--Restricted access for current ISEPS board members only. 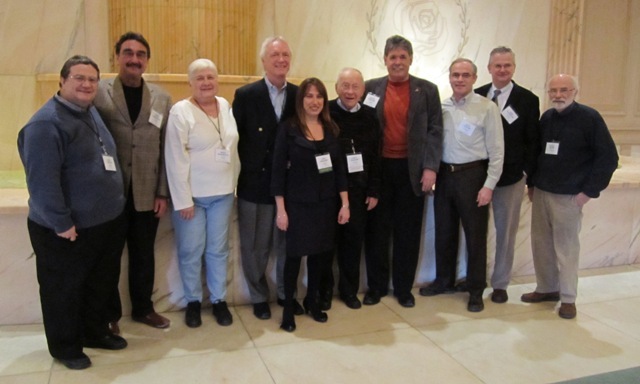 Some of ISEPS's Past Presidents -- Pictured left to right: Gary Rubin, Pete Lagouros, Oksana Mensheha, Norbert Becker, Chris Albanis, Frank Kreska (ISEPS's firstpresident), Bob Graham, John Hanlon, Jim Kapustiak and Ron May. Photo taken at the ISEPS/COS Joint Conference, February 2011. CLICK HERE for a higher resolution copy of the photo in JPEG format.